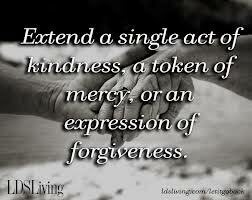 Humanity is so limited in its scope for forgiveness and that is why we need the example of Jesus of Nazareth. The Messiah's forgiveness of those who betrayed, mocked and executed him is the greatest example of the commitment to forgive beyond all human logic, exemplifying the forgiveness of the Father in redeeming an inherently unfaithful humanity. We cannot forgive without the power of God working for us on behalf of the other. This is where forgiveness bites. We can only win when we lose. Forgiveness cannot occur unless we make the battle charge against our selfish human logic and for the unreasonable logic of God. I call it unreasonable, because it is unreasonable to us. But such lack of worldly reason-ability is the reason forgiveness works most completely, because love transcends all logic and commits itself to honoring the divine code; the law from before time. Love's the higher law; a transcendent power that never ultimately fails. Forgiveness works, but we must lay down our lives for it. We must give up our rights, and, in such, honor God - without condition. We are cautioned only to one extent; there will be those who will take advantage at almost every turn - we must continue to forgive and forgive and forgive - with happiest abandon. When we do not give up on our commitments to forgive, venturing forwardly in faith without concern for what we are losing, God gives us an abundance of strength - the strength of love, which as no peer so far as strength is concerned. If we will commit so much to forgiving those against us, those who have betrayed us, those who have wounded us, those who insist on disagreeing bitterly, and those who go the other way despite us, God will show us the purpose in our forgiveness. There is only one way to test God, and that is too determine, by our faith, how faithful God is. If we never give up on love, and forgive beyond our logic, we shall see how faithful God is. God will show us such an abundance of his faithfulness we will be struck down to the bended knee in awe. If we would test the portion of God's faithfulness by our faith, we would quickly find God will test us by the portion of our capacity to love without limit. Both must work in unison - the first is an eternal fact - we must bring the second. Let love have no limit. Let freedom ring like a town bell, clanging for all to hear, that love has arrived, in us, by the power of God. Let that gong resound in the surrendered portion of forgiveness by God's power. Forgiveness, real and raw, is power beyond every dimension.